The National Weather Service has issued a wind chill advisory for Nunivak Island and the Kuskokwim Delta lasting until noon on January 10. 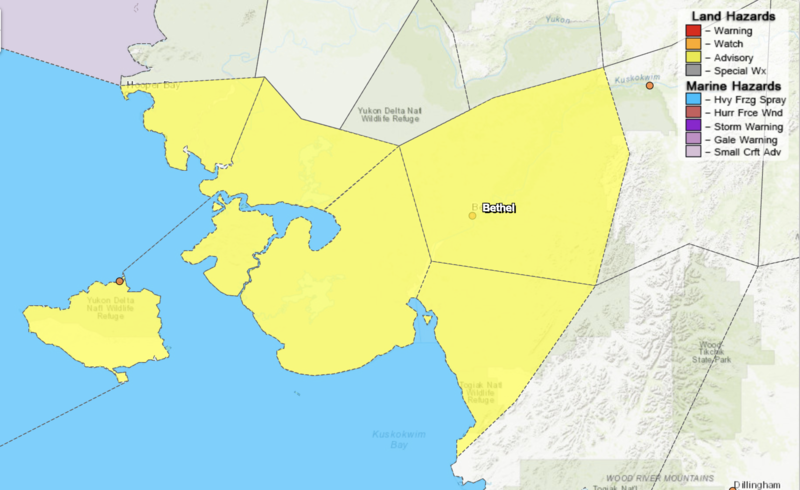 The National Weather Service has issued a wind chill advisory for Nunivak Island and the Kuskokwim Delta lasting until noon on Saturday. Wind chills from 40 to 55 degrees below zero are expected through that time. Temperatures are expected to drop to their lowest point on Thursday night, and the lowest wind chill readings are expected Thursday through Friday night. The Weather Service warns that “dangerously cold wind chills could cause frostbite on exposed skin in as little as five minutes,” and advises wearing a hat and gloves.